The F6 Pro from Teclast will be an attractive proposition for small businesses thanks to a well-balanced configuration and some nice features like a fingerprint reader. However, it will have a tough time competing with more readily available models from Dell or HP. It’s been a few months now since we tested a Teclast product. Over the past two years, the brand has become one of the regulars in our test labs, and generally speaking has delivered some solid performances. Online Chinese retailer, Gearbest, sent us the sample and sells the Teclast F6 Pro for just under $470. Note that while this price includes delivery, it is exclusive of any taxes that may be levied by HMRC or the courier companies on behalf of the vendor. Want to buy tech from online Chinese retailers? Read this first. We’ve had the Tbook 10S, the X98 Plus II, the Tbook 16, the X3 Plus and the X5 Pro. All of these were consistently well received, so credit is due to the team of engineers who design Teclast products. The latest Teclast offering to come through our door is a bit different. This is the first laptop from the company we’ve reviewed, and also the first product that sheds its budget label, focusing on the more lucrative mainstream market. So, without further ado, meet the Teclast F6 Pro, a 2-in-1 convertible Ultrabook. The Teclast F6 Pro is a seriously attractive piece of hardware that wouldn’t be out of place in the flagship range of Dell or Lenovo. It sports an all-metal chassis, likely to be aluminum rather than a magnesium alloy, with the sort of design you’d expect on a mainstream Ultrabook. That means a brushed metal finish, along with a tapered profile with chamfered edges running along the sides. There are two hinges supporting a touch display that rotates 360 degrees, plus there’s a solid chassis that doesn’t wobble or flex. The power button, for once, is not located on the keyboard, but on the side of the device, half an inch away from a microSD card slot, which itself is next to a USB 3.0 port, an audio socket and the power connector. On the other side, you’ll find a USB Type-C connector, another USB 3.0 port and a micro-HDMI port, a rarity on laptops. If there’s one negative point to raise, it’s the sharp edges around the USB ports that could potentially draw blood. 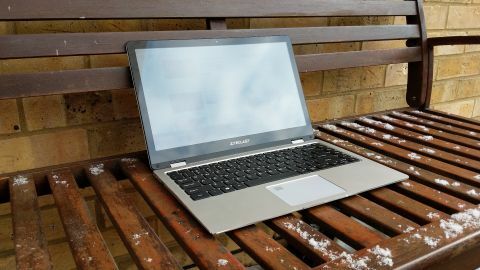 Teclast engineers have built this laptop without any active fans – there are air vents between the hinges to help with cooling, and the base of the laptop is raised thanks to four rubber feet. There’s even a spare M.2 slot with an easy-to-remove cover located on the underside of the device. The entire base can be exposed by undoing a few screws – but don’t expect a fully serviceable laptop. At 208 x 315 x 16mm with a weight of 1.38kg, the F6 Pro is a little heavier than we’d expect. Very few corners have been cut on the spec front. Teclast means business here with a fingerprint reader embedded in the touchpad, a 7th-generation Intel CPU (Core m3-7Y30), an IPS display (13.3-inch Full HD touchscreen) and dual-channel system memory (two banks of 4GB DDR3 RAM). Note that Teclast uses its own SSD, the NS550-2242, which is a 128GB model. Teclast has also incorporated a pair of dual microphones with noise reduction capabilities to deliver better performance when working with Cortana. The rest of the configuration includes a 48.37Whr battery, 802.11ac Wi-Fi, Bluetooth 4.2 (courtesy of the Intel Dual Band Wireless-AC 3165 adaptor) plus a monoblock power supply unit similar to the Xiaomi Mi Air (or the MacBook Air). Nice!